Provide the highest quality education and care for children ages 6 weeks to 5 years. 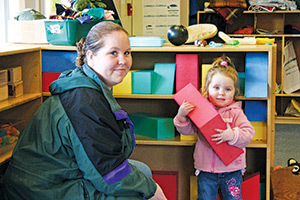 Provide excellent educational and practicum experiences for Early Childhood Education students. Provide great support for families. We believe learning is a lifelong experience. Everyone learns best in a supportive environment through a variety of planned and spontaneous activities. Children learn skills using books and manipulative materials, independence, team building in creative activities, math games, and problem solving. Guiding children into appropriate behavior is preferable. Reminding children of appropriate behaviors, supervising carefully, and explaining expectations in a positive way help prevent problems.